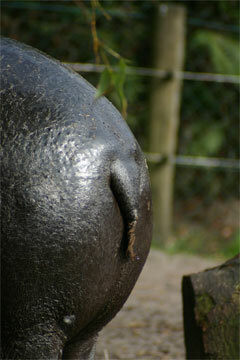 The source of our samples for hormone analysis – a pygmy hippo rear end! Studying the reproductive hormones in Pygmy Hippos is a dirty job, because the easiest way for us to do it us by analysing their faeces. So, our partner zoos collect faecal samples twice per week from the females, then measure the levels of reproductive and stress hormones within them. It might be dirty work, but it’s well worth it, because it is helping us to understand hippo’s reproductive cycle, monitor their stress levels and also develop a test to show whether a female is pregnant. All of this goes towards our ultimate goal of fully understanding the reproductive biology of these magnificent beasts so that we can easily breed them in captivity and produce individuals that might one day be re-introduced into the wild. A photo of Pygmy Hippo poo being collected in Zodiac Zoos in the Netherlands, and example of differences in hormone levels from pregnant and non pregnant animals in time are shown below.